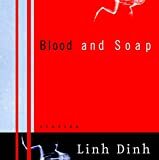 Startling and pointed, Blood and Soap is a collection of short stories where each word is chosen for strongest impact while deftly avoiding the tone of self-congratulating confessional. The author manages to portray life as a Vietnamese-American as a matter-of-fact, referring to the war in an oblique manner rather than a focus point for every story, conveying the feeling that we are actually reading fables on contemporary America. Blood and Soap (2001) 1hr. 35 min. A mass-murderer goes to a massage parlor to assuage his guilt. Stomach-turning scenes of outrageous carnage are interspersed with idyllic shots of naked girls soaping the murderer�s muscular body. Enraptured men and women are shown sniffing bars of soap. Academic experts are also enlisted to expound on the pros and cons of various types of soaps. Rated R, 3 stars. As the universal language�for now�English represents to these students the rest of the world. English is the world. These students also know that Vietnam, as it exists, is not of this world. To cling even to a false English is to insist on another reality. Slang is crowding out real words, he foolishly thinks, forgetting that every word belongs to the shadowy vocabulary of an illicit crowd, invented to reassure and flatter its speaker, and confuse outsiders to what is being said. The way in which the stories are written, almost self-consciously as if they were translated into English, serves more to passively remind the reader of the subject matter than to emphasize the fact that the author is a non-native speaker. The whole book acts as a reminder of the differences between cultures without bluntly pointing it out to the reader. In doing this, it communicates the difficulty of learning a new language and the even bigger hardship of figuring out all the subtleties of action that remain unspoken.